P2P downloads by means of the torrent protocol are one of the best methods at present to share and to get hold of all kinds of contents available on the Internet. One of the problems when it comes to using this kind of protocol is to find the contents that we want, and it's necessary to search for the proper link through specialized websites. TorrentFetcher will help us to find almost any contents that have been distributed on torrent networks, because it performs simultaneous searches on all the important torrent link websites. The program will give us back a series of results with the file names, the size and the sources to download them. 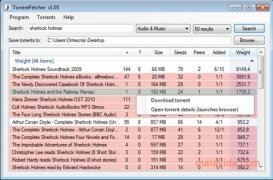 From TorrentFetcher we'll be able to put all the .torrent files to download directly to any folder on our computer and minimize the program to the tray and thus be able to use it as the default search engine for any kind of files. 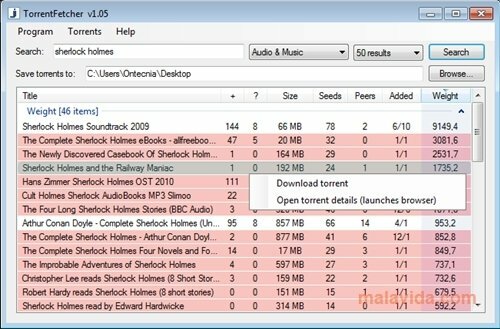 Download TorrentFetcher if you want to avoid having to search on hundreds of websites to find the contents that you want. Once you install the program it automatically updates to the latest version, thus it requires an Internet connection for the update.